The music & mission of BLOODGOOD has been a vital stepping stone & driving force in the maturing process of Christian Metal since their 1986 debut release. Platinum-selling sophomore record "Detonation" strengthened the band's signature style of theatrics, power & emotion - staples that would solidfy their place in rock music history. 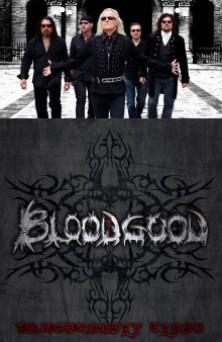 BLOODGOOD's music has been released all over the world, spanning 6 studio albums & 7 official live releases in their discography, with their new studio record, "DANGEROUSLY CLOSE," releasing November, 29th. In 2010, BLOODGOOD was inducted into the CHRISTIAN MUSIC HALL OF FAME for their influential contributions to the music industry thus far. "In the Trenches of Rock and Roll," a feature documentary film about the story of BLOODGOOD, is slated for release in 2014.